It’s true that chicken breasts on there own don’t have much flavor but when you flavor them right you can create one memorable meal! 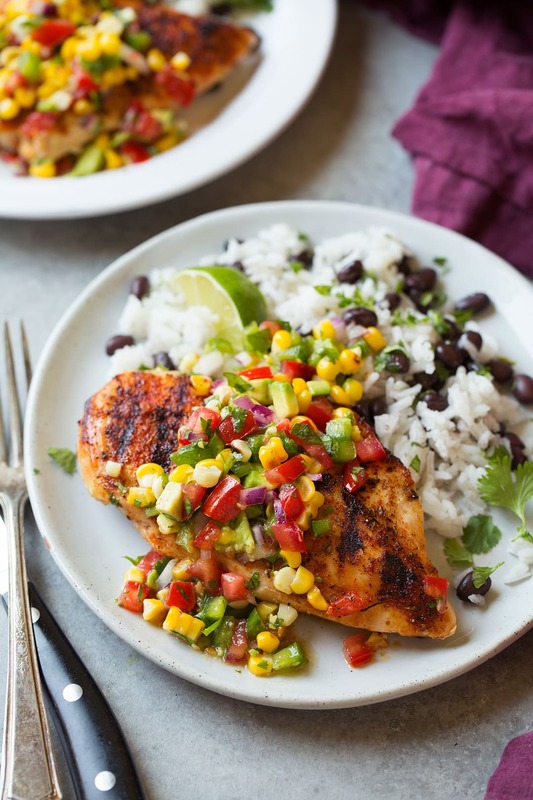 Which is exactly what I think of this Grilled Cajun Chicken with Avocado Corn Salsa! 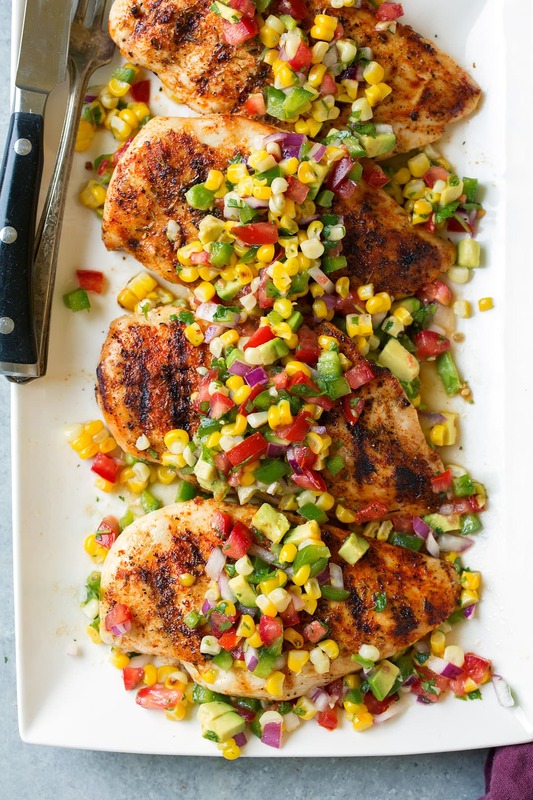 The chicken doesn’t require any marinating just a simple homemade Cajun spice rub then about 8 minutes on the grill (which will add more flavor), and it’s finished with a perfectly fresh and delicious avocado based salsa – which helps balance out the heat of the chicken. This is the perfect new chicken recipe to try this summer! With this recipe it’s Cajun chicken so it is intended to be spicy so keep that in mind. Cayenne pepper is the spicy ingredient here so just adjust that to suit your personal preference. If you were to omit it entirely it wouldn’t really be cajun chicken anymore, but it would still be good if heat ain’t your thang. But no matter what you do, don’t leave off the avocado corn salsa, key flavors here. You know how I love my avocado salsas. Have you tried my Grilled Lime Salmon with Avocado Mango Salsa and Coconut Rice? It’s a reader favorite summer recipe so try that one too! Preheat a grill over medium-high heat (to about 425 degrees). Pound thicker parts of chicken with the flat side of a meat mallet to even out their thickness. 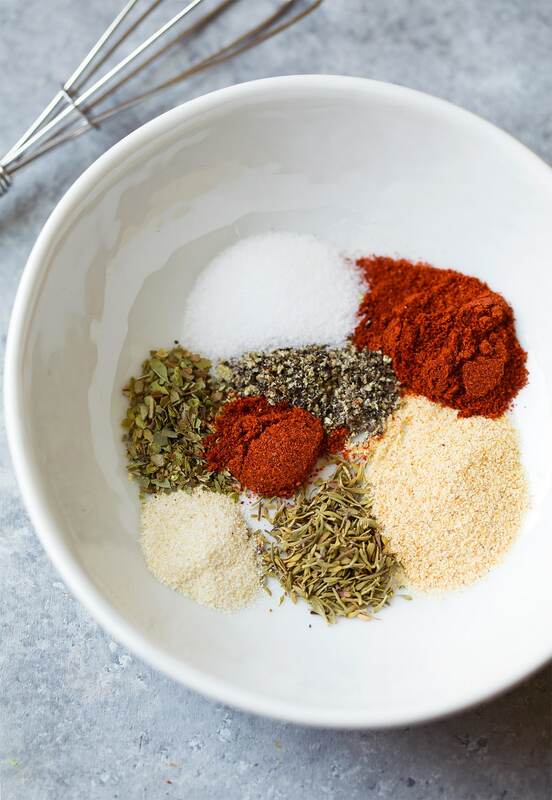 In a small bowl whisk together paprika, garlic powder, cayenne pepper, onion powder, thyme and oregano. Season with salt and pepper to taste (I used heaping 1/2 tsp salt and 1/2 tsp pepper). Brush both sides of chicken breasts lightly with olive oil then sprinkle both sides evenly with seasoning mixture. Grill until center registers 165, about 4 minutes per side. Meanwhile in a medium mixing bowl toss together corn, tomato, bell pepper, avocado, cilantro, lime juice and olive oil. Season with salt and pepper to taste. Let chicken rest off of grill 5 minutes tented with foil then serve warm with Avocado Corn Salsa.